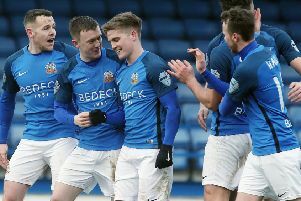 Caolan Marron (left) commanding for Glenavon against Linfield in the Danske Bank Premiership. Pic by Pacemaker. The absence of Glenavon defender Caolan Marron from Northern Ireland under 21s’ latest squad list has left his club coach Paul Millar “gobsmacked”. Millar, the assistant manager at Mourneview Park, watched Marron limp off in the weekend Danske Bank Premiership defeat of Dungannon Swifts due to injury but took time out of his post-match review to praise the centre-back. However, he also voiced frustration at Marron missing international recognition in Ian Baraclough’s squad for the under 21s’ challenge fixtures against Mexico and Bulgaria later this month. “I cannot believe Caolan has not been called up into the Northern Ireland under 21s,” said Millar. “I think he’s the best young centre-half in Ireland, not just Northern Ireland. “But I don’t make those decisions, I’ve not heard anything but just saw the squad. “He has played regularly for two or three years now in the Danske Bank Premiership but has only just turned 20 years old. “He’s fast, two-footed, talks and can tackle but is also really comfortable coming out on the ball and never gets flustered. “I’m so surprised, honestly gob-smacked, that he hasn’t had that chance for Northern Ireland under 21s. “I know they can only pick so many. “The way I would gauge it, if you were to ask every other team in the Irish League they would sign him tomorrow. 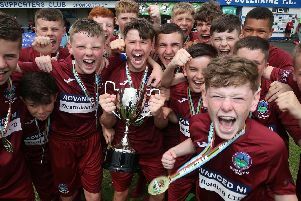 “There’s at least one Premier League team in England on the phone to us about Caolan. “It’s hard for us losing people but we’ve never tried to hold anyone back. “Young players will get chances at this club and stay in the team if doing well. Baraclough’s 20-strong panel will take part across a training camp in Spain and challenge fixtures ahead of the 2021 U21 Euros qualifying campaign set to start across September. The full Northern Ireland squad is as follows: Declan Dunne (Portadown, on loan from Cliftonville), Jared Thompson (Warrenpoint Town, on loan from Chelsea), Eoin Toal (Derry City), Pierce Bird (Notts County), Kofi Balmer (Ballymena United), Daniel Finlayson (Rangers), Bobby Burns (Hearts), Danny Amos (Hartlepool, on loan from Doncaster Rovers), Nathan Kerr (Glentoran), Alfie McCalmont (Leeds United), Jake Dunwoody (Stoke City), Kyle McClean (Linfield, on loan from St Johnstone), Cameron Palmer (Rangers), Ethan Galbraith (Manchester United), Liam Coyle (Liverpool), Caolan Boyd-Munce (Birmingham City), Shayne Lavery (Falkirk, on loan from Everton), David Parkhouse (Derry City, on loan from Sheffield United), Josh Kelly (Maidenhead United), Chris Gallagher (Glentoran).